1 Shaw? "We have established what you are, Madam"
2 Source of "If you have an apple and I have an apple..."
3 Accuracy of "Two tragedies in life"
13 "Alcohol is the anesthesia by which we endure the operation of life." 17 Re "Life isn't about finding yourself. Life is about creating yourself." Shaw? "We have established what you are, Madam"
A: Would you sleep with me for 1,000,000$? Source of "If you have an apple and I have an apple..."
Accuracy of "Two tragedies in life"
Belongs in Man and Superman? Quote also needs checking: "There are two tragedies in life. One is not to get your heart's desire. The other to get it." as opposed to the article's "...lose you heart's desire. the other is to gain it." The "two tragedies" quote is definitely sourced to Oscar Wilde, Act III of Lady Windermere's Fan. Dumby. I congratulate you, my dear fellow. In this world there are only two tragedies. One is not getting what one wants, and the other is getting it. The last is much the worst; the last is a real tragedy! G.B. Shaw once said that he spoke “English” in three different languages: he uses one for writing his plays, he uses the other when arranging official functions of life, and he uses the third with his intimate friends; these three languages are quite dissimilar to each other. The below quote was deleted from the page by User:-ramz-, saying "According to a number of pro-islam sites this quotation is allegedly from "The Genuine Islam", however there seems to be no such work, only two quotes from it circulating on these sites." I have always held the religion of Muhammed in high estimation because of its wonderful vitality. It is the only religion which appears to me to possess that assimilating capacity to the changing phase of existence which can make itself appeal to every age. I have studied him - the wonderful man and in my opinion far from being an anti-Christ, he must be called the Saviour of Humanity. I believe that if a man like him were to assume the dictatorship of the modern world, he would succeed in solving its problems in a way that would bring it the much needed peace and happiness: I have prophesied about the faith of Muhammad that it would be acceptable to the Europe of tomorrow as it is beginning to be acceptable to the Europe of today. User:-anonymous-There is such a work and it I have seen it on a site: http://prophetofislam.com/what_do_others_say.php —This unsigned comment is by 41.242.7.208 (talk • contribs) . I believe the above quote is akin to "religious spam". The linked site does not contain information (author, publishers address, ISBN etc.) The work not only needs to exist but needs to provide authoritative reference for the date and context of Shaw's words. —This unsigned comment is by 87.198.169.92 (talk • contribs) . I have always held the religion of Muhammad in high estimation because of its wonderful vitality. It is the only religion which appears to me to possess that assimilating capacity to the changing phase of existence which can make itself appeal to every age. I have studied him - the wonderful man and in my opinion for from being an anti-Christ, he must be called the Saviour of Humanity. I believe that if a man like him were to assume the dictatorship of the modern world, he would succeed in solving its problems in a way that would bring it the much needed peace and happiness: I have prophesied about the faith of Muhammad that it would be acceptable to the Europe of tomorrow as it is beginning to be acceptable to the Europe of today. Shaw did not shrink from controversy on religious matters, and it is conceivable he made such statements, but they do seem a bit extreme even for him, and uncharacteristic in endorsing any one particular tradition. One of them could allude to Shaw's character Hotchkiss in Getting Married (1908) stating: "I believe the whole British Empire will adopt a reformed Mohammedanism before the end of the century. The character of Mahomet is congenial to me. I admire him, and share his views of life to a considerable extent." but the same character goes on to say "Religion is a great force — the only real motive force in the world; but what you fellows dont understand is that you must get at a man through his own religion and not through yours. Instead of facing that fact, you persist in trying to convert all men to your own little sect, so that you can use it against them afterwards. You are all missionaries and proselytizers trying to uproot the native religion from your neighbor's flowerbeds and plant your own in its place. You would rather let a child perish in ignorance than have it taught by a rival sectary. You can talk to me of the quintessential equality of coal merchants and British officers; and yet you cant see the quintessential equality of all the religions." The Genuine Islam is not in the Library of Congress catalogue, which covers most literature published in English (and much in other languages, too). Neither can I find it in the National Library of Singapore catalogue, although it was allegedly published in Singapore. Let's settle the matter once and for all. The quote is genuine and there is no dispute about its citation either - it is also completely accurate. As for verifying the publication in the catalogue of some established library: it can be found in the New York Public Library (Stephen A. Schwarzman Bldg - General Research: Room 315). —This unsigned comment is by 77.100.17.42 (talk • contribs) . Islam is very different, being ferociously intolerant. What I may call Manifold Monotheism becomes in the minds of very simple folk an absurdly polytheistic idolatry, just as European peasants not only worship Saints and the Virgin as Gods, but will fight fanatically for their faith in the ugly little black doll who is the Virgin of their own Church against the black doll of the next village. When the Arabs had run this sort of idolatry to such extremes ... they did this without black dolls and worshipped any stone that looked funny, Mahomet rose up at the risk of his life and insulted the stones shockingly, declaring that there is only one God, Allah, the glorious, the great… And there was to be no nonsense about toleration. You accepted Allah or you had your throat cut by someone who did accept him, and who went to Paradise for having sent you to Hell. Mahomet was a great Protestant religious force, like George Fox or Wesley…. Interview, (April 1935), as quoted in The Genuine Islam, Vol. 1 (January 1936), and "Being an Unforgivably Protracted Debunking of George Bernard Shaw’s Views of Islam" (3 December 2008) by Rachel Loew; Loew states that there are many paraphrased and abbreviated versions of this statement online, and that it does not actually appear in the body of the interview itself, but only in a separate quote box. Interview, (17 April 1935) in The Genuine Islam, Vol. 1 (1936), as quoted at "A Shavian and a Theologian"
The correct reference is: George Bernard Shaw, 'A Shavian Meets a Theologian' Interview by M A A Siddiqui in 'Genuine Islam', Organ of the Al-Malaya Missionary Society Vol 1, No 1, January, 1936 B Lib catalogue. Please note that this item exists in the British Library Humanities 1 Reading Room. I have held it in my hand. Jaffer Clarke —This unsigned comment is by 82.32.34.238 (talk • contribs) . Given Shaw's predilection for spelling words as they sound, regardless of what anybody else thought, would it not be useful to note more accurately (upon the written page, overleaf) which editions which quotes come from: Either American or English. In most of these quotations, one has no clear idea whether Shaw is speaking English or American, to say nothing of his atrocious spelling. A witty Frenchman has said of us: “The United States of America is the only nation to plunge from barbarism to degeneracy with no culture in between. Animals are my friends ... and I don't eat my friends. To correct anyone's pronunciation is to imply that he is not quite a gentleman. Democracy is a system ensuring that the people are governed no better than they deserve. If all the economists in the world were laid end to end, they still wouldn't reach a conclusion. I can forgive Alfred Nobel for inventing dynamite, but only a fiend in human form could have invented the Nobel Prize. In my view, Anglo-Irish history is for Englishman to remember, for Irishman to forget. Islam is the best religion, with the worst followers. Medieval ecclesiastics, either through ignorance of bigotry, painted Mohammadanism in the darkest colors. They were in fact; trained to hate both the man Muhammad and his to them was anti-Christ. A collection of writings of some of the Eminent Scholars' p.77, by the Working Muslim Mission, 1993 edition. Europe is beginning to be enamored of the creed of Muhammad. In the next century I may go still further in recognizing the utility of that creed in solving its problems, and it is in this sense that you must understand my prediction. The average age (life expectancy) of a meat eater is 63. I am on the verge of 85 and still work as hard as ever. I have lived quite long enough and I am trying to die; but I simply cannot do it. A single beefsteak would finish me; but I cannot bring myself to swallow it. I am oppressed with a dread of living forever. That is the only disadvantage of vegetarianism. The main difference between the opposition of Islam to Hinduism and the opposition between Protestant and Catholic is that the Catholic persecutes as fiercely as the Protestant when he has the power; but Hinduism cannot persecute, because all the Gods - and what goes deeper, the no Gods - are to be found in its Temples. The material of a dramatist is always some conflict of human feeling with circumstances. We have established what you are, madam. We are now merely haggling over the price. Shaw: Am reserving two seats for my show. Come bring a friend - if you have one. Winston Churchill: Impossible to be present for the first one. Will attend the second — if there is one. Also attributed to Mark Twain in More Maxims of Mark (1927), edited by Merle Johnson. "The man with a toothache thinks everyone happy whose teeth are sound. The poverty stricken man makes the same mistake about the rich man." Is there really no hyphen in "poverty stricken"? In looking for the source of a quote, I find that it exists all over the internet but still without source. Can anyone help source this quote (and then add it to the page)? (i) "The only time my education was interrupted was when I was in school"
This is listed (twice) in the "Unsourced" section above, but the Wikiquote page already states that this is "Widely attributed to Shaw from the 1970s onward, but not known to exist in his published works. It is in keeping with some of his sardonic statements about the purposes and effectiveness of schools. First known attribution in print is in Neil Postman and Charles Weingartner's Teaching as a Subversive Activity (1971), "G. B. Shaw's line that the only time his education was interrupted was when he was in school captures the sense of this alienation."" (ii) "From a very early age, I’ve had to interrupt my education to go to school"
"I've had" implies that the phenomenon is still in process, so this would only be grammatical if said by someone who is still at school. That doesn't sound like Shaw, unless it was spoken by a character. Re "Life isn't about finding yourself. Life is about creating yourself." 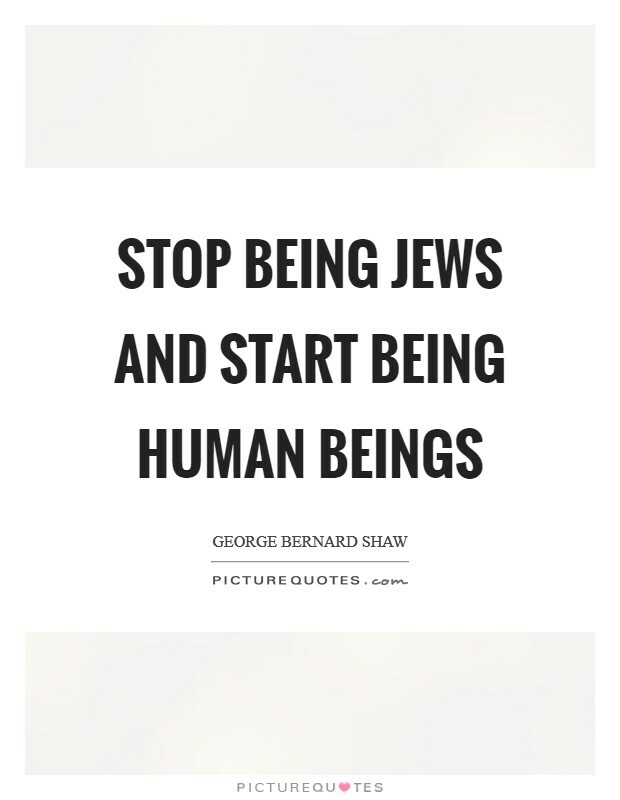 "Stop being Jews and start being human beings"
This quote is sometimes attributed to "Literary Digest, October 12, 1932". This is incorrect. Found it: Shaw's "Shofar-Blast" The Literary Digest, October 22, 1932, p. 20 (PDF). This page was last edited on 22 January 2019, at 20:30.